Every other year, Beauty Industry West’s Board of Directors selects a recipient for the Legend of Beauty Award based upon the criteria of an innovator whose thinking, commitment and practices have changed the direction of our industry in significant ways, and one who has contributed to the advancement of the beauty industry as a whole. 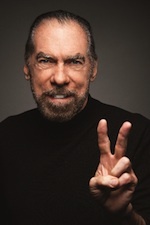 This year John Paul DeJoria was selected, and he will share his experience in co-founding John Paul Mitchell Systems, the initial challenges, as well as his environmental commitment and distribution choices that have distinguished him as a true leader in the professional beauty industry. In 2007 he signed a legally binding document dictating that none of the family members or generations to come are to sell part of or the entire John Paul Mitchell Systems Company for 360 years, ensuring that the products will always remain professional and will stay where they started, with the Mitchell and DeJoria families. John Paul DeJoria's rags-to-riches story exemplifies the American dream - once homeless, he struggled against the odds to achieve success, launching three global enterprises and paying it forward, living by his motto, "Success Unshared is Failure." With just $700 he started John Paul Mitchell Systems, converting it into the largest privately held salon hair care line, and later turned a passion into success by founding Patrón, the world's number one ultra-premium tequila. A longtime activist for sustainable business practices and corporate responsibility, John Paul makes these practices paramount as he continues to evolve and grow his businesses, and inspire others. NOTE: Over $1,500 in Door Prizes and other gifts will be presented at this event. Seared Salmon Peppercrusted and Soy Glazed served with Basmati Rice, Sugar Baby Carrots and Green Beans. Dessert - Mixed Berries Cup with Orange Liqueur & Whipped Cream, served with Freshly Brewed Coffee, Tea & Iced Tea. Thirty years ago, two friends were inspired to create a company that would support the success of hairdressers and provide luxury hair care at an affordable price. With just $700, they launched a revolutionary hair care system with three products: Shampoo One®, Shampoo Two® and The Conditioner™. Today, their dream is a reality. Paul Mitchell® currently produces over 100 products from award-winning styling and care products to cutting-edge heat styling tools and professional hair color and is available in over 80 countries worldwide. Barnet Products markets and sells specialty ingredients and fashion concepts to cosmetic and personal care companies. Focused on in vivo tested actives and innovative "System Formers", our products demonstrate unique properties highlighting popular textures and concepts in Asian markets. Please ask about our Natural Collection and visit www.barnetproducts.com for additional information. PakLab is taking a more contemporary, customer oriented approach to R&D by modernizing the standard CM lab into a luxurious environment, where customers can meet in an atmosphere like no other in this industry. We intend to market a specific and tangible PakLab “Brand of Services.” While continuing to offer make-and-fill capabilities, PakLab will now be able to focus on new customers looking to upgrade or reformulate their products.PakLab is a fully-integrated packaging solutions company and supplier to Fortune 100 as well as to large and medium-sized Consumer Product Companies. With four state of the art manufacturing and packaging facilities throughout the U.S., PakLab is a respected leader in Technology and Innovation through the delivery of World-Class Packaging Concepts, Products and Services, and a primary supplier to The Flexible Film, Contract Manufacturing, and Co-Packing markets, offering much more than R&D, OTC and Cosmetic Contract Manufacturing. PakLab covers everything from flexible packaging, sampling, and co-packing to new product development and a turnkey supply chain for the creation of your own brand. Hub Folding Box Company, Inc. is a premier printing and folding carton company producing innovative packaging solutions for leading consumer product companies. Their reputation as an innovative leader dates back to its founding by Francesco DiRico in 1918. HFB is widely recognized for its creativity and innovation in the packaging industry, specializing in printing and converting high-end paperboard and plastic folding cartons and specialty laminations of "B", "E", "F" and "N" flute single-face corrugated. HFB also provides contract packaging and fulfillment services, further developing its capabilities through its Plastic Technology & Thermoformed Parts division. HFB is fully integrated with high quality service departments, with an experienced staff of in-house Graphic and Structural Designers, Mechanical Package Engineering and Digital Imaging (C-T-P). With a diverse Customer base and over 95 Years of Packaging Experience providing innovative and affordable solutions such as Liquid Ink Technologies™ for leading consumer product companies in beverage, confectionary, cosmetic, personal care, pharmaceuticals, nutritional supplements, entertainment, recreational and media, HFB is proud to be "Made in the USA" and has earmarked $10 Million for new State-of-the-art capital equipment improvements to energize their technology in 2014. Hub Folding Box - Liquid Ink Technologies™ provides customers with creative alternatives for more economical and Environmentally Friendly printing solutions without sacrificing the look of the brand! Benchmark Cosmetic Laboratories is a full-service contract research and development laboratory based in Irvine, California. Founded in 2007, the lab continues to be one of the fastest-growing cosmetic laboratories in the country. Benchmark partners with clients around the world to realize their custom concepts by creating premium, cutting-edge, first to market beauty formulations.